Stuzha is a dark ambient artist from Siberia, in the northern reaches of Russia. In a frigid environment like Siberia, it is no surprise that Stuzha gravitates toward a polar ambient style. The music is heavy in field recordings and takes the listener on an aural journey through these frozen lands. With a re-issue of his debut album, and the possibility of something new on the way, it seemed like the perfect time to interview Daniil, the man behind the music. Put on your warmest coat, because the music and conversation are about to take you into the sub-zero environs that many of us will never experience first-hand. Michael: Thank you so much, Daniil, for agreeing to speak with me about your dark ambient project, Stuzha. For readers who aren’t familiar with your sound, could you give me a short description of Stuzha? Daniil: Hi Michael, thanks for having me here. Stuzha‘s sound evolves over almost two decades now. It is hard for me to link it with some well-defined musical genres, but the long-term Stuzha companions are field recordings and guitars. Initially, started with moody folk-ambient dark tunes, acoustic mainly, and later developed a denser “drony” sound. I’d describe the project using tags: cinematic, drone, dark, ambient. The most important, however, is the atmosphere and field-recordings associated with it. I record various outdoor sounds and while listening to them I generate ideas of wrapping them into a musical piece. There is a lot of associative thinking going on. Michael: How long have you been a fan of dark ambient music? Daniil: Probably around 20 years now… I can remember dark ambient as a relatively fresh genre in the musical scene. I’d say that it somehow spiraled from black, drone, doom, gothic metal and old-school ambient into an independent genre. The similarities between styles are quite evident, yet emotions are different. Michael: Who are some of your earliest influences, which led you to record in this genre of music? Daniil: I’d say that the majority of ambient releases during 2000-2005 period were quite influential, to name a few: Raison d’etre, Desiderii Marginis, Vidna Obmana, Arcana, Vali, Northaunt, Kammarheit, Phelios, and others. However what actually triggered me to start composing my own music is the Burzum album, Filosofem and Angelo Badalamenti’s music, especially his Twin Peaks soundtrack. The latter is just a magical piece of work that was immortalized by the amazing David Lynch’s TV-series (of course I’m awaiting the new season!). Another great example of such a powerful ambient-visual marriage is the music of Olafur Arnald, and the recent Broadchurch TV-series. To me those bundles are quite inspirational, the same goes to Tarkovsky films and Edward Artemiev music. To all of my projects the story is of high importance, I cannot do anything too abstract. Daniil: I am certainly fond of Northaunt music and without a doubt his Horizons is an hugely inspirational album to me. I met Hærleif in 2013 at the Blåsvart Aften Vol.7 event (highly recommend to visit). It was my pleasure to talk to such a modest and intelligent man. Its always amusing to see people behind dark music not being so dark in real life. Or is it well-played optimism? His recent album Istid I-II I also find very interesting and actually not so gloomy as some of previous releases. I also can recommend his recent release from The Human Voice project. Very relaxing and calm release to listen to. In fact, I’m listening to it now while writing this. I guess it is a slightly more personal project than Northaunt. Michael: Your two full-length releases seem to take a unique life of their own, or did the themes dictate these differences? Daniil: They are topical, yes. Also, I slightly changed my attitude towards music since the release of Siberian Sketches. 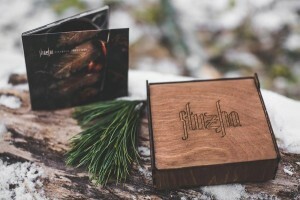 Bringing folklore elements to the latest Stuzha release was not an option considering the chosen topic. Michael: Butugichag, your 2015 release, focused on a very specific theme, the Soviet gulag system. 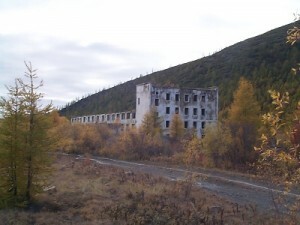 Specifically, the Siberian labor camps of Kolyma. Did this concept have any personal significance to you and your family? Daniil: Fortunately, there is nothing personal. The choice of topic was a mere reflection on things I read and watched. At the time I was overwhelmed by various emotions and decided to put them into something more solid. I’m also quite interested in the history of the country where I was born. In Russian, history there is not black and white but only a gradient; it is impossible to tell immediately what is good or bad. Things are complicated as they are, yet people still can make them worse. It was always about the suffering of remarkable people, and unremarkable people with immense power to impose the suffering. To make it more ‘fun’ for everybody, the history keeps switching places. Once those despised and rejected may become leaders. Some carry the baggage consisting of personal fears which later turned into pure hatred. What I wanted to show with Butugichag is just an example of an extremely dark place which was deliberately crafted by human beings to destroy their own kind. To think about it… once free people imposed the worst possible destiny on themselves by following the path of hatred and fear ignited by the rotten ideology. It is not a political album, that sort of thing can happen in every state if ruling boundaries pushed to extreme. My aim is to lead a listener to this place mentally and ask the question, why did it exist in the first place? I think we need more conceptional “think about it” albums which can lead you to some questions. This is, for example, why I quite like the albums of Velehentor, although musically I’m not always resonating well with them. Michael: You are Siberian by birth, but if I’m correct, you have now moved to England? Why did you decide to make this move? Will England be your permanent residence? Daniil: Yes, I moved to the UK about 8 years ago. Personally, it was not a very difficult decision to make since my career prospects were quite dim. Science is not well supported in Russia, people in power are busy with more ‘important’ things, and after my PhD I had to decide either I’m going into industry or looking for a job in academia elsewhere. The decision to skip a job in industry was not actually a bad one, since the oil industry (I’m a geophysicist) is not doing great at the moment. So, I moved to the UK and some time after my wife joined me here. We are British now, but it is hard to say whether we will stay in the country permanently. There are still many factors that can influence it. We actually quite like warmer countries (laughing). Michael: As a Siberian, what are some of the things about this part of the world which left a lasting impact on you? 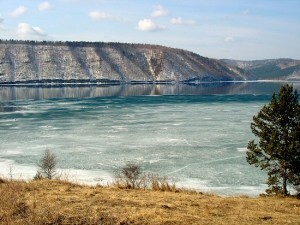 Daniil: I certainly miss the Siberian nature. I’ve been to many places, yet the feeling of a total self-composure can exist only there. Siberia, it is like open space sometimes, you can quickly dissolve yourself there. Be gone and lost within minutes. This hardly can be done in Western Europe. The civilisation bursts around you and there is no quick escape. In Siberia, also the farther east you go, the wilder it can get. I think the Baikal Lake and surroundings had the biggest impact on me. I still often go there in my dreams. Michael: Your debut album Siberian Sketches was very diverse. The theme of Siberia was consistent throughout the album. But, the sounds themselves were wildly varied. For instance on track 4, “Deti Podzemelyz”, you have incorporated what I assume to be some Russian opera music. The use of this audio sample really livens up the album, making it a more dynamic and active listen. Then there are other tracks which are more field recording focused. Still others highlight sounds of an acoustic guitar. Was this diversity something you consciously achieved, or did it happen naturally, almost like an accident? Daniil: At that time I was not planning albums as I do now. The album was recorded during 3-4 years time span. Every song is actually related to a certain event in my life, in this case a travel. I was visiting different places and had mixed feelings on my return. This is why the album can be be slightly “sketchy” sometimes. I think it will be hard for me to do something like this now. Taking Butugichag for example, it was a focused work towards a solid, coherent album. Who knows if Siberian Sketches II will be “sketchy” enough? Michael: There is a good bit of guitar-work in Stuzha, some electric and some acoustic. How long have you been a guitar player? Have you ever played guitar in a metal band, or some other genre? Daniil: Oh I’m a rubbish guitar player actually. I had an acoustic guitar teacher sometime ago, and approached the stage when I could play something from notes… but I got quickly bored. I already knew by then why I’m learning guitar so it was sufficient more or less. When I do recordings I can spend lots of time practising a riff. Michael: Is guitar the only traditional instrument you play? Daniil: Loosely speaking I can play a piano quite lousy (laughing). I do synth playing for the Algol project. This is generally a slow tempo work. I’m more into sound extraction and processing than actually playing things technically. Michael: Are there any very interesting places that you have captured field recordings? Do you gather these slowly over the years, or do you take extended journeys into the wild to capture these sounds? Daniil: There are interesting places and risky moments. 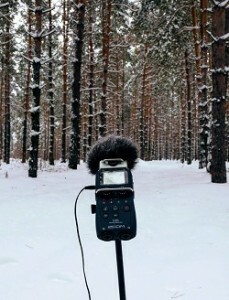 Recently, I’ve been through an extensive winter field-recording session in Siberia. The first time after 8 years of no winter! The sounds are really great and hopefully they go to my next Stuzha album. This was a bit of hard work since it was pretty cold outside as you can imagine in January (around -35°C at night or 0°F). Another interesting recent experience was in Switzerland when I was recording some wind on a mountain. Suddenly, a huge piece of ice fell a few meters away from the top peak. It literally almost killed me… and I managed to record it. This will certainly go into my album! So, as you can see, it is pretty dangerous work! I will go to Iceland to do some recordings soon. Do you think it is a crime to mix Siberian-Icelandic field recordings for the album about Siberia? (laughing) Don’t worry I will not do that, the purity of the product is important to me. Michael: Now that you are living in England, a place which I assume is much more densely populated than Siberia, do you find it harder to collect field recordings? Is it harder to find inspiration in the warmer climate? Michael: Do you consider the cold, isolated north to be a central theme to Stuzha? Do you intend to stick to this template for all future Stuzha albums? Daniil: I’m thinking about suspending the project after the next release (possibly next year). It’s getting increasingly hard for me to sustain its viability while being based in the UK. I will shift attention to my other projects. 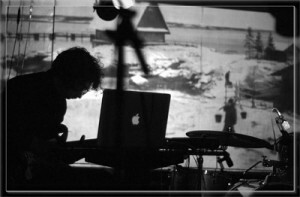 Michael: Your debut, Siberian Sketches, was recently re-released through Ksenza Records and Infinite Fog Productions. What kind of additions did you make to the album for this re-release? Are you happier now that this updated version is available for fans to discover or re-discover? Daniil: The re-released version is extended with 3 new tracks and also remastered with added bass guitar. I think it sounds more mature and complete now. Ksenza also did great work on the artwork and the updated quality of the release, so yes I’m happy. Michael: As Stuzha, you have released two full length albums and one EP, entitled Through The Snowfield. Which, I might add, is also brilliant. What can we expect of Stuzha next? How soon might we be expecting your next release? Daniil: Thanks. So in future plans I intend to use field-recorded material and work on Siberian Sketches II. This is a winter counterpart, which is different to the first release, which featured spring-autumn recordings mainly. This should close the cycle of the Stuzha albums about Siberia. Maybe I will move to other topics, but at the moment I’m not sure if I want to link Stuzha with them. Michael: Many dark ambient artists like to create a sacred space for their recording sessions. Maybe they will burn some incense, meditate, or something like this, in order to achieve a higher state of consciousness. Do you have any of your own rituals, which you follow during each session? 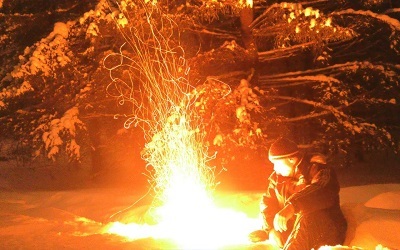 Daniil: I do like burning stuff, and probably a fire in the forest would be my first choice to boost inspiration. Maybe I should get a house with a fireplace? But seriously, I can do a bit of candles sometimes, but the right mood is the most important component. I never record anything under influence of alcohol or when I’m sick. It somehow ruins the magic and I get a bit pissed-off about it. Michael: Do you think the apocalypse is coming? If so, how do you think it will happen? Daniil: Everyone will have their personal apocalypse before the real one comes. I can easily slip into some depressing stuff here, so in brief, I just say that we’re not doing so well as some other species on this planet. Our strong desire to feed on desires disregarding the common sense will lead to self-destruction. We somehow decided that we are chosen and we do all in our power to prove this wrong. If humanity will not start thinking hard about the future of this planet we will end up in the ditch much sooner than the real apocalypse will come. By real apocalypse I mean, for example, a huge asteroid strike or super-earthquake. We have to be prepared to solve outer global problems and not spend all resources to feed personal egos. I’m not being an alarmist I just don’t like the state of the world today. Michael: You recently released a music video for another project, Black Wanderer. Is this a project that you will be spending more time on in the near future? Daniil: Black Wanderer is a new cinematic drone project. It is truly cinematic since I actually extract and reuse monologues/dialogues from various movies. These are mainly not so fresh but great sci-fi movies, such as, The Thing from Another World, Day The Earth Stood Still, etc. The main idea is to create an alternative soundtrack and possibly reincarnate some emotions about the movie. I also try to use monologues/dialogues which can be thought provoking. Michael: You also have a space ambient project, Algol. Would you like to tell the readers a little bit about this project and how it differs from Stuzha? Daniil: I’m actually surprised that this interview goes from the Stuzha perspective, since Algol is an older project of mine. But, I guess since both projects are different, some people tend to like one more. Algol is a space-ambient project which focuses on meditative and contemplative mental space exploration. About 4 years ago I turned it into ambient without “dark” additive. The dark counterpart now shifted to Black Wanderer. I want to keep Algol peaceful and relaxing. There is a lot going on in synthetic sound creation/extraction for this project, but I’ll leave it out since we are talking here mainly about Stuzha. Michael: Thank you so much for your time, Daniil. I will leave the final words to you! Daniil: Thanks a lot Michael for the interesting questions. Oh, I’ve said enough, I conclude with Samuel Beckett – “Every word is like an unnecessary stain on silence and nothingness.” So let us do more music!